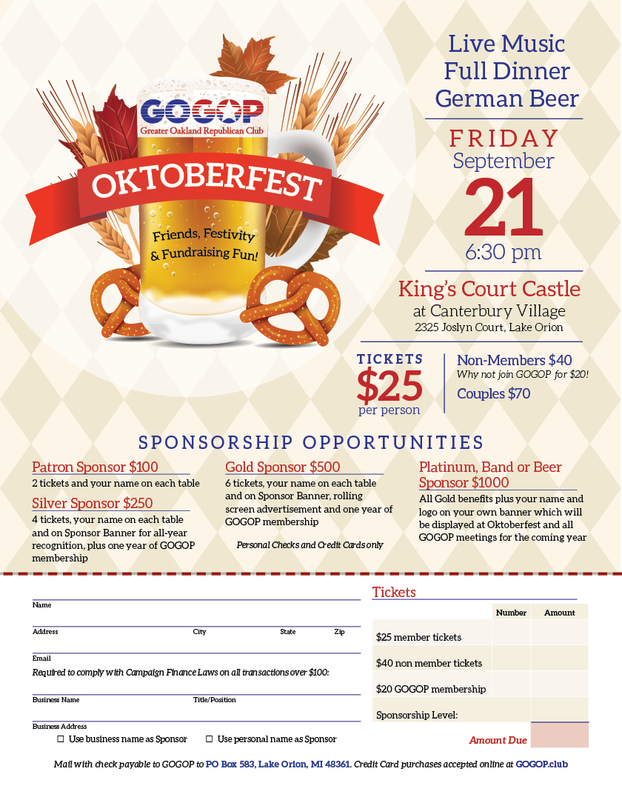 Plan to Join GOGOP & Friends for the raising of the 2018 GOGOP Oktoberfest Banner! OKTOBERFEST - Friday, Sept. 21st! We're raising the new 2018 Oktoberfest banner! Will your name be on it? Your sponsorship info has to be in by Wednesday at 10 am to be included on the new 2018 Oktoberfest Banner. So don't delay any longer! You've seen the banners. They are pretty awesome and they go everywhere with us! At every GOGOP event and meeting. You won't want to miss this opportunity to have your name and logo showcased, nor will you want to miss seeing the banner raised! Sponsorships come with tickets to the banner raising...and to a whole lot more! There's food, beer, wine, music and all kinds of fun! Tickets and sponsorships are available at our GOGOP website or email Mari-Ann to confirm your order. For tickets and sponsor info, click here. If you have questions, or to get your order confirmed in time, you can email Mari-Ann Henry.